A smile makeover or designing is a process by which features of your teeth are changed giving you a bright, beautiful and confident smile. This is recommended if you are suffering from different dental problems. Smile makeovers combine multiple cosmetic dentistry treatments, meaning a comprehensive enhancement of your smile. Cosmetic procedures like tooth whitening, teeth recontouring, cosmetic braces, dental veneers, dental implants can all be combined to produce the goals you require. Our dentists will conduct a comprehensive evaluation of your teeth, gums, underlying support structure and bite to determine candidacy for a smile makeover. If your evaluation reveals that you have an oral health problem such as a gum disease or active decay, you will need to undergo proprietary treatment prior to your smile makeover. The key we feel to a successful, long lasting smile makeover is careful a thorough planning stage. An integral part of a Smile Makeover process is the preview of potential results that can be evaluated before treatment begins. Before and after photos of other patients who have had smile makeovers offer examples of the results you may expect to see. The photos may also give you an idea of the smiles you like and which you would like to incorporate into the design, or the desired colour of the smile make-over. First of all at Stoma Advanced Dental Care we have an in depth consultation to understand and record your main wishes. Further we have incorporated a variety of dental technologies to show you the changes that you can expect to see in your smile. We will take a series of careful facial measurements that will help in the creation of a smile in proportion to your bone structure, age, and gender. Even the size, length, shape, and color of every tooth is considered and designed to ensure neuromuscular comfort and a pleasing, balanced look - perfect for you! Usually photographs will be taken to digitally evaluate the proposed smile changes such as tooth size, shape, and colour. Along with we take your inputs to design your smile on the computer in front of you. This will then act as the ‘blue-print’ for your new smile to ensure accuracy of the final result. We will answer any questions you may have about the dental treatment. We can make any changes that you wish at this stage. Once you are happy with the smile that has been designed we can then begin the process to replicating this in the mouth. The teeth are gently reshaped as required based on the corrective work required. This is usually carried out under local anesthetic but in some instances the reshaping is so mild that no local anesthetic is required. Once reshaped, accurate impressions are taken of the teeth and send to the laboratory. 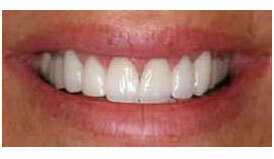 Temporary teeth are made based on the previously designed smile and fitted to the teeth. You will be shown the new temporary teeth and adjustments can be made on these teeth as required. The teeth are then reviewed and any changes / adjustments to the temporary veneers are made. These changes are recorded and sent to the technician in the laboratory who will be responsible for producing the final teeth. Your bright new smile is checked and fitted and rechecked with you. Once you are happy with it, we will then secure the new teeth with a special dental adhesive. 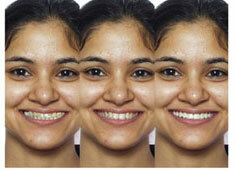 Any minor adjustments and polishing is carried out and your smile makeover is then complete. Commonly many different options may be possible but it is important your general oral health is evaluated, and is of a good standard before a plan can be developed for your smile makeover. Teeth Whitening is a simple and non-invasive dental treatment used to change the colour of natural tooth enamel and is an ideal way to enhance the beauty of your smile. Teeth whitening can be done in the clinic or at home using custom made bleaching trays filled with bleaching gel. Teeth straightening options available to us are orthodontic braces, veneers, crowns and surgery. Teeth straightening surgery, or orthognathic surgery is often advised for patients with severe skeletal deficiencies. Examples of such deficiency include cleft palate and jaw discrepancies. This type of teeth straightening surgery can only be performed by oral maxillofacial surgeons under general anesthesia and is the most invasive of all options. Treatment period is also very lengthy as it is paired with orthodontic braces for pre-surgical preparation and post-surgical maintenance. Orthodontic braces involves the placement of a small bracket on each tooth which are then linked or tied together with a wire. The brackets are usually placed on the front surface of teeth. There are times when the brackets are placed on the inside surfaces of teeth, mostly for aesthetic purpose, commonly referred to as lingual braces. Treatment usually takes 18-24 months to complete. Braces are placed under the supervision of a qualified orthodontist. Stoma Advanced Dental Care offers the following corrective appliances to bring teeth, lips and jaws into proper alignment for optimal facial balance. Veneers and crowns are also used to straighten teeth. Veneers are made entirely from porcelain or ceramic. With veneers there is no reason to have gaps between your teeth, stained, badly shaped, or crooked teeth. A veneer placed on top of your teeth corrects these problems. Porcelain veneers are thin shells of ceramic that bond directly to the front and top surfaces of the teeth. When bonded to the teeth, the ultra-thin porcelain veneers are virtually undetectable and highly resistant to coffee, tea, or even cigarette stains. For strength and appearance, their resemblance to healthy, white tooth enamel is unsurpassed by other restorative options. Because they are thin, light can shine through them and they take on the natural colour of the underlying tooth. Crowns can be constructed either fully in metal or in porcelain, or partially in porcelain that is laminated on a metal or zirconia structure. This masks the portion of the crown that is visible in the mouth, making it to appear straight. Treatment takes roughly 2 weeks to complete. Where damage to a person's teeth is extreme and apparently beyond repair, we use porcelain or porcelain "fused on to gold" crowns to make the smile appear "as new". This is an extremely reliable technique for repairing the most severe dental problems, even permanently replacing missing teeth to offer a complete smile and a functional bite. A bridge is a device used to replace missing teeth — attaches artificial teeth to adjacent natural teeth, called abutment teeth. Bridges are either permanently attached (fixed bridges) or they can be removable. Fixed bridges are applied by either placing crowns on the abutment teeth or by bonding the artificial teeth directly to the abutment teeth. Removable bridges are attached to the teeth with metal clasps or by precision attachments. An alternative to veneers, bonding can be used as a restorative procedure for teeth that are chipped, cracked, discolored, or misarranged. The bonding procedure can be completed in a single clinic visit and significantly improves the appearance of a tooth. However, since the plastic resin used is not as strong as your natural tooth enamel, it is more likely to stain, chip, or break than natural teeth. Bonding typically lasts three to five years before repair is needed. If your teeth appear short, they may actually be the proper length but covered by too much gum tissue. We can correct this by performing the periodontal plastic surgery procedure, crown lengthening. Crown lengthening (or crown exposure) is required when your tooth needs a new crown or other restoration. This procedure create a new gum-to-tooth relationship. During this procedure, excess gum and bone tissue is reshaped to expose more of the natural tooth. This can be done to more than one tooth, to even your gum line, and to create a beautiful smile. Gum Sculpting procedure also covers unsightly, sensitive or exposed root surfaces and to prevent future gum recession. Another cosmetic procedure is the soft tissue graft. It is used to cover unattractive tooth roots, reduce gum recession and protect the roots from decay and eventual loss. Bone grafting is also done following tooth loss to preserve the socket/ridge and minimize gum and bone collapse. There is less shrinkage and a more aesthetic tooth replacement for either an implant crown or fixed bridge around the replacement teeth. Professional examinations at regular four to six-month recall appointments are necessary. Developing problems can be found at an early stage and repaired easily, while waiting for a longer time may require redoing entire restorations. We will contact you when it's time for your recall appointment. The information on this web site is only intended as an introduction to this procedure and should not be used to determine whether you will have the procedure performed nor as a guarantee of the result. The best method of determining your options is to consult dentist at Stoma Advanced Dental Care who will be able to answer specific questions related to your situation.